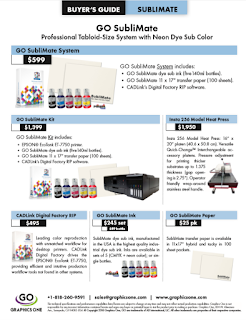 Today Graphics One announced its new GO NeoTack dye sublimation ink, a new ink featuring a new patented ink tack tack technology along with having a color gamut of 30% to 40% greater than normal dye sub ink. Our new NeoTack ink redefines expectations for dye sublimation ink. For added information please click on: GO NeoTack Info.